Neverwinter Nights 2 is a 3D role-playing game set in the Forgotten Realms. The fantasy game art for creatures closely, if not exactly, matches the Dungeons & Dragons 3rd Edition roleplaying game and some of it was probably simply imported from the previous game, Neverwinter Nights game. This page of fantasy game art from the Neverwinter Nights 2 computer roleplaying game has general information on the moon elf playable race. 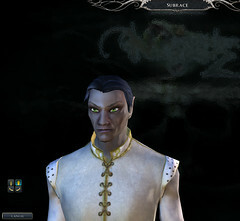 Moon elves are the most common sort of elves in Faerûn. Also called silver elves, they have fair skin (sometimes tinged with blue) and hair of silver-white, black, or blue. Their eyes are blue or green, with gold flecks. They are the elven subrace most tolerant of humankind, and most half-elves are descended from moon elves. In earlier games, elves had the characteristics of Moon Elves. 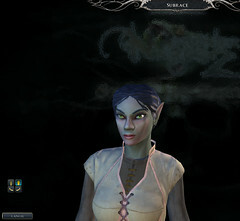 Neverwinter Nights 2 was based on the 3rd Edition of Dungeons and Dragons, and elves were not yet linked to the Eladrin, which were introduced in the 4th Edition.